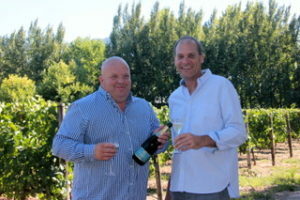 Paul Gerber and Colmant owner JP Colmant. Paul Gerber will shortly be joining Colmant Cap Classique and Champagne in Franschhoek as winemaker. He was previously at nearby Le Lude where he was instrumental in establishing this cellar as one of the leading producers of Cap Classique in the country. Colmant is itself a highly decorated cellar and Gerber will surely enjoy continued success here. Gerber is also currently doing his master’s degree in “the use of cork as a closure and winemaking tool for bottle fermented sparkling wines during ageing on yeast lees” in collaboration with Stellenbosch University, the University of Rheims in Champagne and the research bodies Winetech and Nietvoobij in Stellenbosch. Emma Bruwer takes over as winemaker at Le Lude – she was formerly Gerber’s assistant.